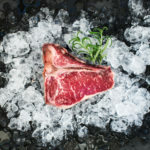 Product innovation from Vion: The meat producer is introducing a new deep-frozen range to the market under the COOL CUTS label. From the outset, Vion will rely on high-quality product in marketing matured beef from the GOLDBEEF premium brand. The range is aimed at restaurateurs, hoteliers and other bulk consumers, as well as the food retail trade. Individually packed, deep-frozen and in packaging ready for sous-vide preparation are entrecote, T-bone, filet and a wide range of special cuts currently trending and ideally suited to the demands and requirements of this target group.